3...2...1... Find similar and different words before you blow! WordTNT allows students to learn synonyms and antonyms while under a time limit as the fuse goes down a stick of dynamite. 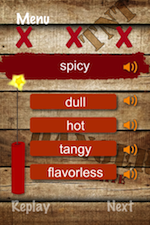 Check out this explosive and fun application that will have your students begging for another try to work on vocabulary skills! The Main Page of this application has three different dynamite buttons as well as an "Options" button. Sound - You can turn on and off the sound by pressing this button. Timer - Turn on/off the Timer by pressing this button. Race - Turn the option on/off to have the timer start and continue as the first button is pressed during game play. The synonyms/antonyms will auto-advance to see how many you can get correctly in the given time. The three levels of play include "Easy", "Medium", and "Hard". Each level allots a different amount of time per word set with Hard being the shortest. On the Main Page, choose between "Similar" (synonyms), "Different" (antonyms), and "Sort" (both). A direction will then appear stating to touch the two words that are similar, different, or to order the words from the most to least similar to the top word. There will be a word at the top and 3-4 words underneath. Each word has a speaker next to it. Press the word that is similar or different or press, hold, and drag words in order. If a word is incorrectly pressed/placed, a red "x" will appear next to the word. If correct, a green check mark will appear next to the word or "Correct!" will appear on the screen. If you are playing the "Similar" or "Different" games, you will get immediate feedback and the words will switch around if incorrect. You will also have to press "Next", unless you are in "Race" mode to progress to the next set of words. If you are playing the "Sort" game, you will always have to press "Check" after moving the words into the correct order to move on to the next set of words. 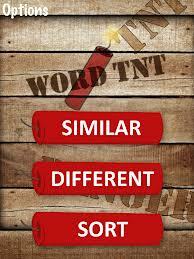 You will get three chances to get the words correct, otherwise the TNT will "explode" automatically. 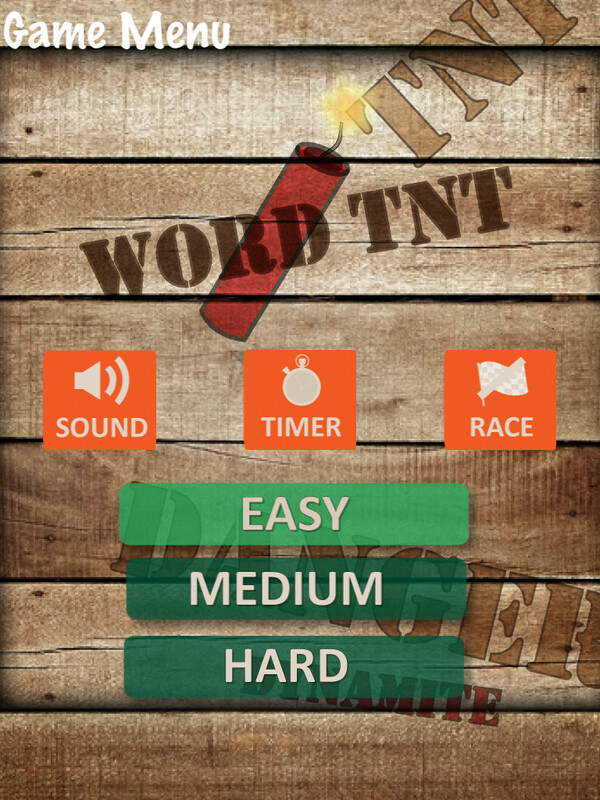 In addition, if you chose to use a timer, if the TNT stick runs out before the user chooses the correct words, the game is over. 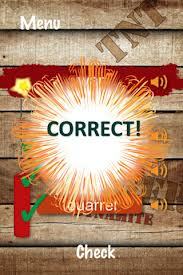 On the "Race" game, you will see a screen with the number of words, number of perfect answers, and a number of errors. You can then choose to "Replay" or return to the "Menu". The application is simple to play with only a few different options/settings. My older elementary/middle school students find the application motivating and have asked to play it multiple times. I love the fact that when you press a speaker, it will read the word aloud, especially for those who have difficulty reading. It is great that the application allows the user to place words in order from most similar to least similar, which is great for vocabulary skills. The application has a dynamite theme, which is seen throughout the application in its timer, buttons, and more. I would love it if there was a menu that showed the user how to use the application and what each option does as well as the time limits for each. 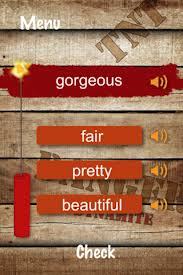 Synonyms/Antonyms - This application is all about synonyms and antonyms as well as sorting the most to the least similar to a given word. Vocabulary - Discuss the meanings of the words on the application. Discuss how words are similar and different. Draw pictures of the words (if possible). Talk about the category each group of words fits into. Create a graphic organizer/chart to show how the words are similar or different on a scale. Expressive Language - Have students create sentences using the words shown on the application. Consonantly Speaking was given a copy of the application to review. No other form of compensation was received.